The Cotswolds is a protected area of beautiful countryside, farms and villages in the heart of England. It covers 790 square miles and lies just 75 miles west of London, sitting between Bath and Stratford-upon-Avon. It’s a really attractive part of the country, so much so that in 1966 the British government recognized the special nature of this region by designating the Cotswolds an official Area of Outstanding Natural Beauty (AONB). For quite a few years now my wife Elizabeth and I have been running a company called Cotswold Walks specialising in self-guided, guided and custom-made walking holidays in this area, so let me try to give you a brief introduction to my favourite walking destination and tell you why it’s a great place to visit. You’re walking through history, and it comes alive! The Cotswolds have actually been settled for thousands of years. The remains of prehistoric hill forts are found in many places. Belas Knapp near Winchcombe is a Neolithic long barrow (burial tomb) that is over 5000 years old. During the Roman Empire the Cotswolds town of Cirencester was the second largest city in England. Chedworth Roman Villa, run by National Trust, shows you what a Roman household was like. 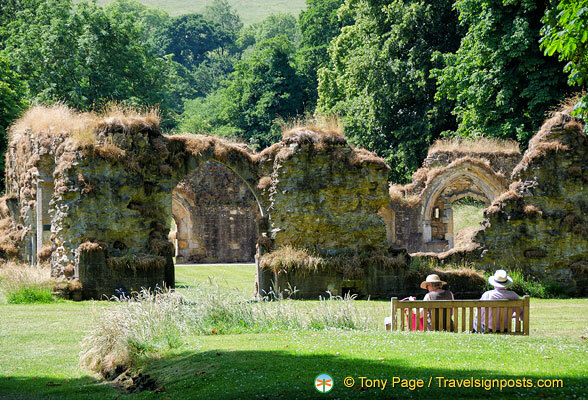 Hailes Abbey, now ruined, was a place of pilgrimage famous for its phial of Holy Blood from the crucifixion. In the middle ages the northern Cotswolds prospered due to a famous breed of sheep called the Cotswold Lion and wool merchants profited from its export. The wealth created then built the houses and churches we still see today. In the Industrial Era the power and wealth shifted southwards to the Stroud Valleys thanks to the abundance of water that was harnessed to run the new cloth mills. Cloth to dress the English Redcoats at the time of the War of Independence in America was produced in Stroud. The name of the Cotswolds is said to have come from the word ‘Cot’, meaning a sheep enclosure, and ‘wold’, meaning high pasture, and sheep still graze on the region’s hillsides today. You’ll definitely see a lot of them when you’re walking! Nowadays, farming and tourism are equally important with many overseas visitors coming either for day trips or extended stays to enjoy the wonderful landscape, food and history of the area. Plenty of sheep in the Cotswolds! One of the best walking/hiking/trekking destinations in Europe. Limestone hills run along the western edge of the Cotswolds and these, along with the many river valleys and woodlands, create perfect walking conditions. Considered by many to be the walking capital of England, it is one of the best walking/hiking/trekking destinations in Europe. Cotswold footpaths are numerous and well signed. 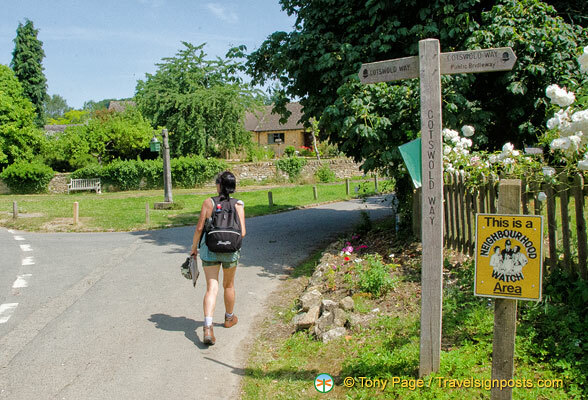 Several long-distance footpaths run through the region, the most famous being the Cotswold Way, a 102-mile (164 km) national trail and former pilgrim route starting at Chipping Campden in the north and ending at the steps of Bath Abbey in the south. The trail runs along the western edge of the Cotswolds, following the Cotswold escarpment and offering spectacular views. People come from all over the world to walk this trail. It takes anywhere from 7 to 14 days to do the walk and the shorter the time taken the more challenging the walk. The trail is in very good condition and is well signed. Clear Cotswold Way signpost at the entrance to Stanton village. Along with the long-distance footpaths there are many local footpaths throughout the whole area. Stay in any town in the Cotswolds and you will see “Public Footpath” signs pointing you to trails through the countryside. These paths were created over the centuries as workers and villagers found the quickest way to their place of work, local market or church, and are legally protected as “Public Rights of Way”. 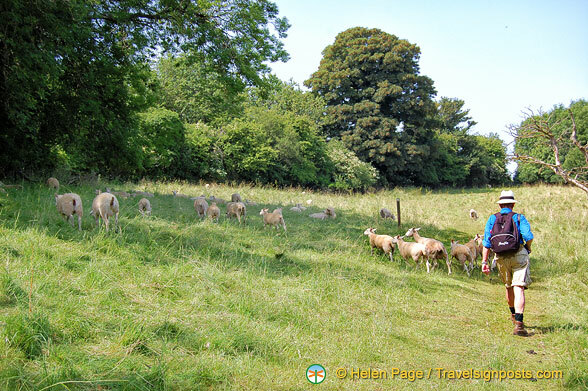 The network of paths connecting the various villages offers walkers the freedom to explore the countryside across farmer’s fields and through ancient woodlands – provided you stick to the paths! DIY walking. Purchase a walking guidebook (we recommend Goldeneye “Cotswold Classic Walks” or Pathfinder Guides “The Cotswolds – Walks”), buy an Ordnance Survey Explorer map (“OL45 The Cotswolds” covers most of the area) and plan your walking vacation. You can base yourself in a holiday cottage for a week and do day-walks or walk from point to point, staying in B&Bs/hotels as you go. A little help from a friend. Another way to do it is to choose a self-guided walk offered by a company providing them. Obviously, I hope you choose us! We offer a variety of walks throughout the Cotswolds, with a relaxing mixture of walking, pub lunches and time to explore the many interesting villages on your route. Most companies offering self-guided walks in the UK and Europe have the same general approach; the difference is in the detail and accuracy of the information provided and the support they give you. We live in the Cotswolds, so make a point of keeping our routes up-to-date – things change all the time. We can help you decide which trip would be best for you, then book your B&Bs/hotels, arrange your daily luggage transfer and give you detailed route notes and maps in a handy-sized booklet. Local assistance is always on hand by simply calling the office if you have any questions during your tour or find yourself unsure of the way (hey, it can happen to us all!). Walking in a group. You can also opt to join a guided walking tour. With this option there’s no need to read maps or route-notes – instead you can simply follow your guide. We have ourselves been offering these for quite a few years now, and our guides are local experts who can show you things you might not notice on your own. One advantage of going this route is that you have the chance to meet like-minded walkers who want to maximize their time in the Cotswolds. Whoever you go with, you have to be careful to choose the right walking holiday to suit your tastes and capabilities. If you’re lucky enough to have friends who have walking experience in the Cotswolds, they’ll be able to give you an idea of what’s involved. But perhaps the best way to decide is to work with a local company to sort out what’s best for you. Single centre with daily walks, circular route or point to point? There are many choices and destinations. The best word to describe British weather is “changeable”. The best walking weather is from May through September. These months are more likely to be warm and dry, but you still need to prepare for both sunshine and rain. Walking in the off season can be delightful. When the leaves fall off the trees everything changes – views open up, sunlight pours through the trees and even the rain can be magical. Which Part of the Cotswolds? 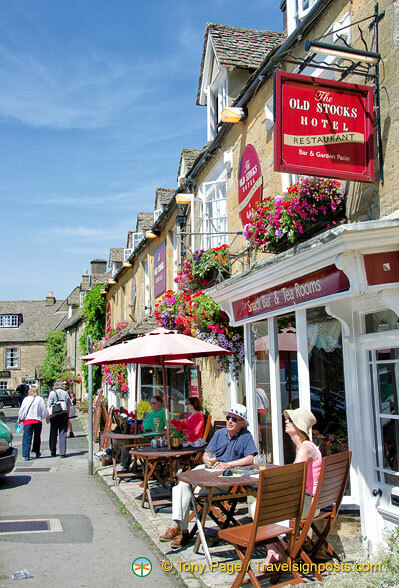 The north Cotswolds, including Chipping Campden, Broadway, Stow-on-the-Wold, Bourton-on-the-Water and Winchcombe is the most popular area with tourists and walkers. The walking trails in this area are very good and the villages are beautiful. The Cotswold escarpment on the western edge provides more challenging walks. Burford and Bibury in the eastern Cotswolds have pleasant, gentle walking. The southern Cotswolds around Painswick, Cirencester, Castle Combe, Tetbury and Bath offer interesting river walks and open meadows. Really, you can’t go wrong in any part of the Cotswolds. Getting to the region is generally pretty easy. You can take a direct train from London Paddington to Moreton-on-Marsh in the north Cotswolds or arrive in Cheltenham Spa for a cultural start to your tour. Trains from London also go to Stroud, Kemble or Bath in the south Cotswolds. Direct links from Heathrow and Gatwick via bus and train to Reading and Oxford and then a change of train are also an option. Buses run through most areas but the service can be infrequent (some routes offer only a few buses per day). Use the website www.travelinesw.com to find out about transportation options. If you do not want to rent a car, with enough research you can make the local bus system work for you. Whichever way you choose to create your vacation, you will have a unique experience walking in this area. The landscape is gentle and the walking is easy, but the hills still give you a satisfying walking challenge. The views, especially from points along the Cotswold Way, are astonishing. Along with farm fields there are many nature reserves and beautiful protected ancient woodlands. 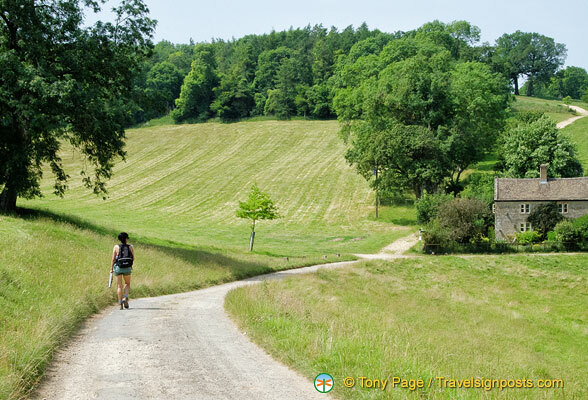 Most of the walking trails are well away from the roads, giving you a peaceful experience of the countryside. The Cotswolds is a very special place and I hope you have the opportunity to come and experience it for yourself. Andrew Guppy and his wife Elizabeth run Cotswold Walks. The company specialises in self-guided, guided and custom-designed walking holidays in the Cotswolds and has been trading for over 20 years. For self-guided walkers, up-to-date route notes and maps are provided in a handy-sized booklet. Their small guided walking tours are fully supported and cover different themes such as Scenic Walks, Arts and Crafts, Gardens and History.